When I tried using /media/backup or /home/admin/backup as destination in sbackup it locks the drive’s folder. For /media/backup the drive unlocks after a reboot and the folders sbackup created are available but for /home/admin/backup a reboot doesn’t give me access to the drive and if I chmod /home/admin/backup I have access to the drive but the sbackup folders are locked. Is there a way to stop this from happening. Ok, so I didn’t read all the article. I use dapper 6.06 and have updated it. But I don’t have the purge option. Purge would help. Also about root, I read it was possible to create an extra “GUI” user that will be root and that this was a bad idea, is this because of software being free to do dumb stuff, me being free to do dumb stuff, or both ? So I found out how to install a .deb and now am happily running sbackup 0.10 (after uninstalling 0.9) . I also found out more about root during my travels. Anyway I like the way things are now. So thanks, this is one of the best pages I’ve seen and sometimes just getting a chance to ask a question is what’s needed. 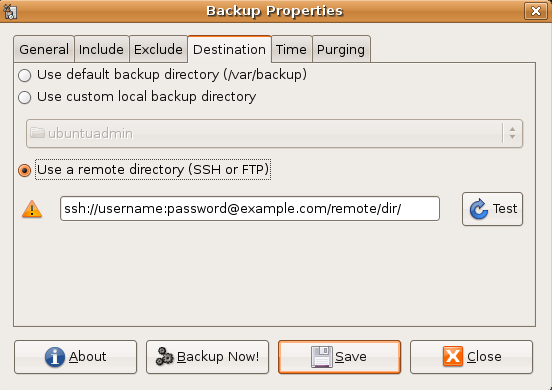 I’am running sbackup under Ubuntu Edgy Eft 6.10 i386, When i try to restore /var it fails! I have come to the conclusion that it’s the /var/run directory that fails, is this map nessesary for a proper backup? 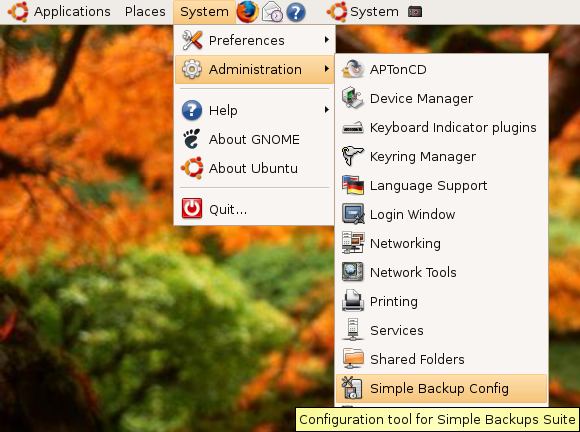 I have installed Sbackup 0.10 on Ubuntu 6.10. After configuring it the way I want I click save. Then click Backup Now and nothing happens. When I close the program and reopen it it has not saved my setitings. Help please!!!! I just want to get my system backed up. Spent many hours trying but have gottenm no where!! 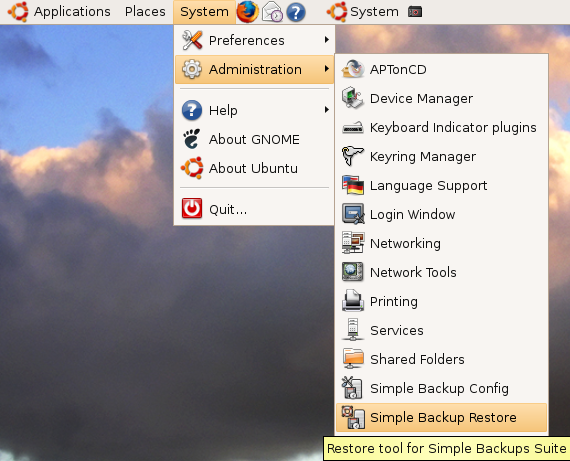 I’ve used SBackup for a while now and it always worked really well. 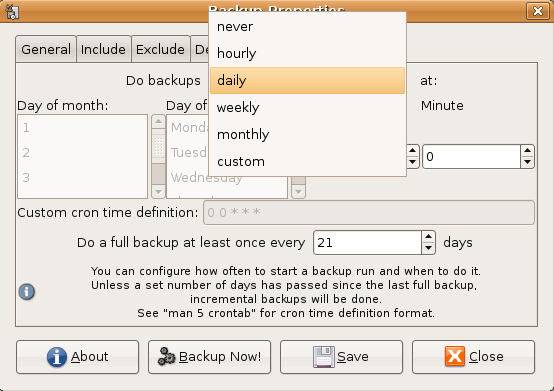 However for some reason it just doesnt make any backups anymore no matter whether it’s triggered by cron or manually. It only creates a text file called ver with 1.3 in it. But no files! I would appreciate any comments or help on this very much! 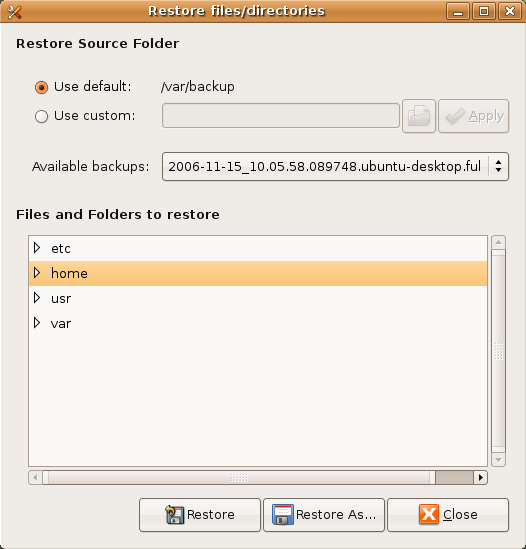 Same problem as Johannes, I just installed sbackup on Ubuntu Feisty and when I try to backup to my external USB drive, I only get a file called “ver” and no other files. Help would be much appreciated. Thanks! I have installed Sbackup on two machines I have at home, an HP Pavilion dv8000 laptop with 2 gig ram and an HP Pavilion ZD8000 with a gig of ram. 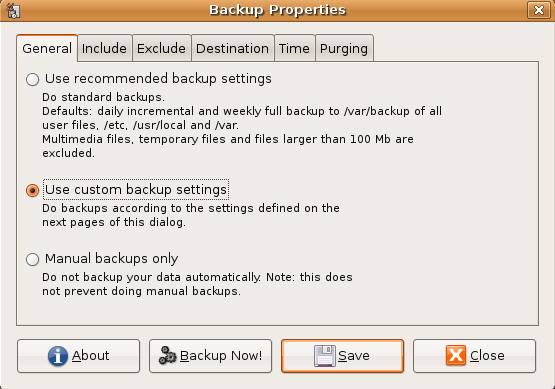 the program will backup as expected but the incremental backups aren’t automated. Both of the cron files reported to be created by the program are in place. the cron.d entry is there and contains data i.e. the files nad directories to back up. The other cron file is empty. Is this correct? I doubt it but don’t have a clue. i have a simple problem: I activate the prog and then follow the main window and ask me for the root password. After the input the request is password wrong. No way!! I can open a shell and use su. Password is absolutly correct. What is my Fault? Does it use any kind of compression? Is there a way to set the compression level?? That would be nice. 1) No option to backup without tarring or compressing. I prefer to backup everything as-is, ie. to just copy the files across without any specific treatment. This is just in case a file gets corrupted during a disk crash or the power suddenly goes out etc. If “files.tgz” becomes corrupted, then I’m stuffed, but if one of the files in the backup gets corrupted then it isn’t such a big problem. 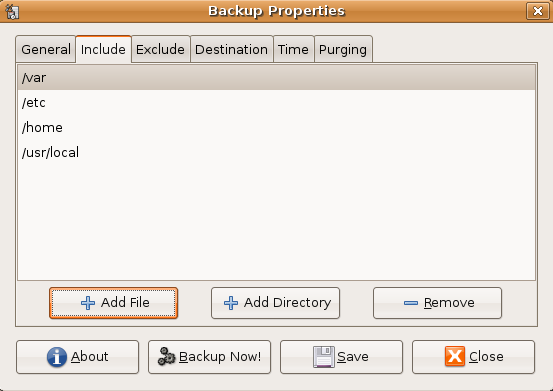 2) Small issue, I’ve started the backup process but I realized that I forgot to exclude a particular directory, and there seems to be no easy way to cancel the backup. What about ensuring the files being backed up are “quiet”, that is, they aren’t in the middle of being written to, or a daemon isn’t part way through updating several files so an inconsistent picture is taken? Does sbackup do anything to ensure that? The easiest way to stop a backup would be to kill the process. sbackup tells you the PID number when it first starts. “kill PID” will stop it. 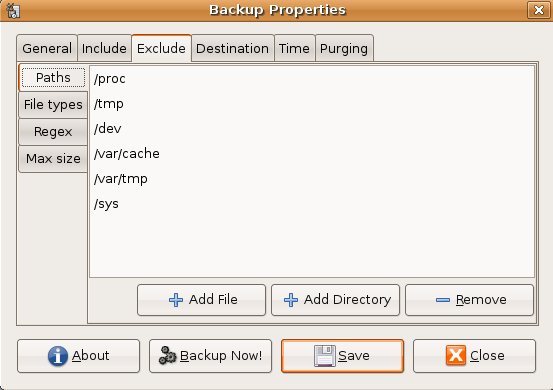 Sbackup is certainly a superb backup tool, have been using it since available. Great writeup on Sbackup!!! Using dual disks I use the CRON setup in Sbackup to backup a ton of data every night to my dedicated second hard drive for backups. Sbackup has never failed me. Plus, for many users, I find it to be the most simple and reliable one I have found. I would like to back up my emails and a few files and stuff on a casual basis but find a lot of the techie speak above above me. It would be nice if simple terms like backing up evolution emails etc or documents/file name was used. Is there a link somewhere using similar terms.Sorry to be so pedestrian, but that’s me just learning to walk after Windows. How do I backup to a local ethernet drive? allright, i think i did it. I just inserted the destination in remote destination and instead of ftp or ssh I used smb. Well, now i’m thinking about it, I don’t know if it worked. Because I can’t see it in the place it’s supposed to be. sbackup installed easily in Intrepid. I attempted to back up with the default selections and exclusions, and sending the output to a (mounted) USB hard disk, which sbackup saw. I assumed that when I backed up my home folder, all subfolders would be included. The program appeared to start, gave me a process number, and my HD indicator flickered as if sbackup were looking around. I went back to work, but an hour later the sbackup process was no longer running … and the target folder for the backup was empty. I assume this bear of small brain is missing something, but what? to support Obform, I’m trying to manually run sbackup on 8.4 (hardy heron), it pops up the process number, but when I go look at the process table it gives me the process number then says sbackupd and my backup never runs. 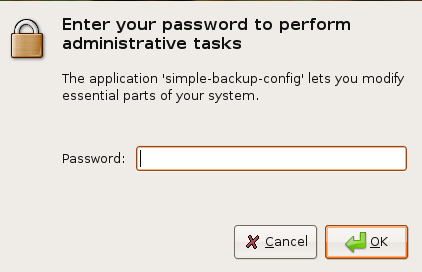 I’m running sbackup on another Ubuntu machine, 8.10 (Intrepid) where it seems to work just fine. Is there a problem with 8.4? The problem I found with sbackup (as it applies to Intrepid Ibex) was that while backing up and restoring worked very well either over the network (via CIFS), directly attached USB, or over SCP, I was unsuccessful attempting to restore the backups to another system while simulating full system failure. SBackup itself would not allow restoring from those archives, and manually untar-ing as root just hung the system. Any other ideas? I’m currently using Keep, but SBackup is just so much nicer to manage otherwise. What that like system backup ghost if with windows ? Although I have been using Windows for probably 30 yrs, I never got into doing backups because I trusted the System Restore facilty in Xp which worked, for the most part. I’m not an under the hood expert but used my pc to do taks, reasonably well. I aslso drive my car without being an expert motor mechanic/engineer. However I installed Simple Backup & restore on my AMd 64 with 500gb sata and 2gb of ram with Jaunty Jackalope (AKa vers9.04). Very impressed. Unfortunately it gives a black screen after entering the password at login. So, How does one restore a syastem from back up when the system does not even present a desktop or meanns of acessing the restore? You r advice greatly appreciated.John. Is there a way to configure sbackup to follow symlinks? I attempted to upgrade to Ubuntu 9.10 from 9.04. Before downloading 9.10, I ran SBackup to backup my files to a thumb drive. I also verified that SRestore saw the files on the thumb drive. After downloading 9.10 and restarting, my computer locked up. I reloaded 9.04 from a CD, downloaded the SBackup program from a repository, and attempted to Restore the files. I clicked “use custom” and browsed to find my backed up directory on the thumb drive. The files are there but they are not highlighted and SRestore says there are no files to restore. I checked “show hidden files” but the files will not highlight. I can click directly on the thumb drive, which does bring up the directory and my files. Why won’t SRestore restore my files? I also had a second backup method. I would make a copy of all my important files to a second USB drive. I wouldn’t mind just copying these files back to the hard drive and setting up my specific settings again. But I had encrypted two of the files with a PGP key and passphrase. After reloading 9.04, I used the same passphrase to create a new PGP key. When I click on these encrypted files on the thumb drive and attempt to decrypt them, it says I do not have the key. I’m guessing that even though I am using the same passphrase as on my previous version of 9.04, Ubuntu is creating a different key. If I were able to use SRestore, I believe that my specific settings including my PGP key would be restored and I could decrypt the encrypted files. I tried using Srestore again and it worked this time. I was able to restore all my saved files, settings, and PGP key. I’m not sure what the trouble was, I must have been doing something wrong. All my files are back on my hard drive and I can access the encrypted files again. When a failure like this happens it is quite the learning experience. That’s when you find out if your backup system works or not. I’m quite happy with the Sbackup system and will continue to use it. Using a knoppix live CD I accessed the computer and found my /home/tobias full of some .ecrypt…..-files, but my original data had all gone. I deleted those files. Now the system accepted my password again at boot, so I was able to start the restore function of sbackup. IT DOES NOT WORK!!! My wifes & sons accounts are unaffected, but I would LOVE to get back my evolution mails I know to be trapped in this files.tgz! It is quite scary to find a backup tool make vanish your whole data! Nice, It’s even better in Lucid. The best options is backing up via SSH to a remove location. I use sbackup and had to reinstall the system “new learning” and when I connected to my firelite removable drive to restore using sbackup restore there were no images or files showing? I am using SimpleBackup and so far I quite like it. What I am a bit unhappy about is the lack of control over the purging, or even more to the point that I don’t quite understand how it will purge exactly. 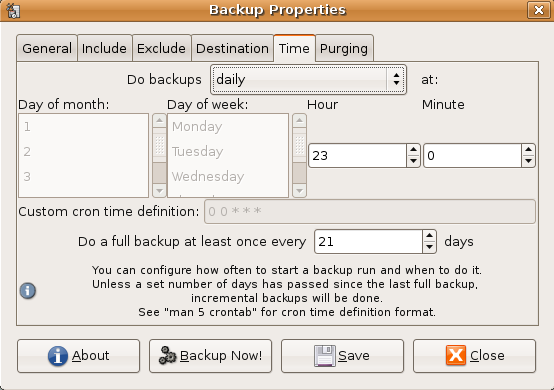 Right now I have a fairly standard setting, incremental daily and full backup every 4 weeks. I find this confusing. I haven’t been using it for a month, but what’s it going to do? It will essentially have 7 backups per week, but each of them will contain different files, right? Some files will have changes every day, so they are going to be in every backup. Is it going to purge an entire week by consolidating the files into one pack, keeping only one copy for those files that changed several times in that week? I’ve been using SimpleBackup for the past month, and it seemed to be working fine. However, this week I decided to run a test restore on a new hard drive, as making backups is all fine and good, but not so useful if you can’t restore. Apparently this is a known issue that doesn’t have any solutions that instill confidence. Since I don’t actually need to do a restore right now, I could safely install a newer version of SimpleBackup and restart my backing up process, but not everyone will be in my situation. Moreover, what if there’s another new snapshot version that invalidates my backups when I really need them? To be fair, I haven’t yet tried the upgrade and checked it for corruption (how? ), but right now I think I’ll look into some other backup options. where are these packages are stored in the file system? I want to make a backup in a file server, the application allow incremental backups an full backups with iso images which can be burned on a DVD? I will very appreciate your answer. I use sbackup and it works fine except that I notice the files in the incremental backup include lots of files that haven’t changed. In fact most of the incremental backup archive is unchanged files. 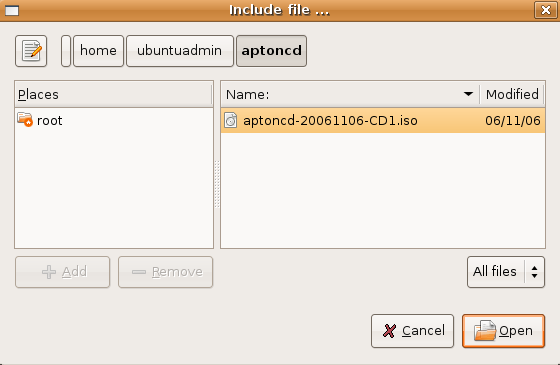 hello,i found no available Sbackup by using apt-cache search and synaptic . Could you give me a source address (for debian lenny 5.07) where i can get Sbackup? This is really a very great site for beginners of Linux. I am a little confused though regarding the use of UBUNTU interface in most postings whereas this site is for Debian. Can anyone clarify this for me. Charles — I think the answer to your question is that Ubuntu is based on Debian, uses ‘.deb’ files for installing programs, and probably uses some Debian libraries. 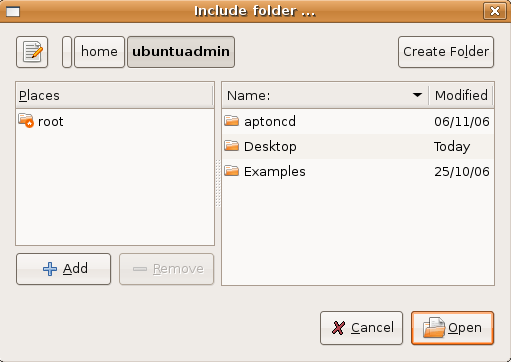 And because Ubuntu is such a popular distro, a lot of references to Debian will be coming from Ubuntu users. The stability and reliability of this package is questionable. As of 6/14/2011 there were 48 open bugs and little sign of development. A second bug reporting site shows signs of development. If that’s true then this backup utility is completely useless. If you’re backing up just a couple of files or three, you can do it by just copying them, and if your’re backing up a reasonable amoun of data you’re not going to manually restore the file owners and permissions of a few million files, are you? Is there a backup utility that will preserve file ownership and permissions?